A blogger said that the proper planning and effective operations of the new planes was not the objective. This is why there has been so many problems with the brand new planes and the services. 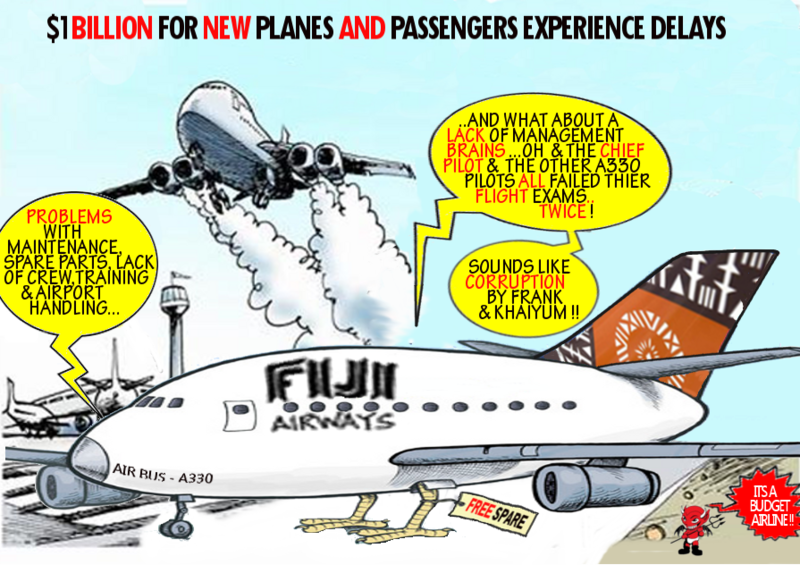 The blogger goes no to say that Khaiyum and Aunty Bano were eager to set up the scheme where they use FNPF pensioners money to purchase the planes, under a company that they control, Waqavuka Ltd, and then lease the planes to Air Pacific for huge profits. Meanwhile, FNPF pensioners have had their pensions drastically reduced -some now recurving as little as $50 a month! This suggests that Khaiyum has either paid off the loans to FNPF, in another world record breaking time, or that they have just decided to ignore repaying it altogether. If so then this is fraud and theft!. Now, the blogger says, we are seeing problems with the new planes and disrupted services because Khaiyum's over-paid foreign consultants, who do not know what they are doing. But what is also interesting is that those foreigners who were brought in as consultants, then given permanent jobs in the company, and then they hired more foreign consultants to advise the earlier consultants who were made permanent! and the mismanagement continues, while the chairman Nitin Patel looks the other way and happily spends his bribes.